Ah, the sounds of spring. Birds tweeting, bees buzzing, and noses sniffling and sneezing. Fortunately, there are some great medicines out there to help reduce the symptoms of spring allergies, and most of them are inexpensive and over-the-counter. Here’s an updated guide to help you pick the medicines that are best to relieve your family’s suffering. But first: before medications, remember non-medical approaches. People with allergies should shower and wash hair after being outside (though it’s not practical or good to just stay inside all spring!) You can also use nasal saline washes to help reduce pollen exposures. For my medicine guide this year, I’ve included some photos to make these easier to find. A new trend seems to be color coding, with generics matching the brands in color and “look and feel”. That’s good if it makes the cheaper generics easy to find — they work just as well, and really should be your first choice for any of the options below. Antihistamines are very effective for sneezing, drippy noses, and itchy noses and eyes. The old standard is Benadryl (diphenhydramine), which works well—but it’s sedating and only lasts six hours. There are better choices. 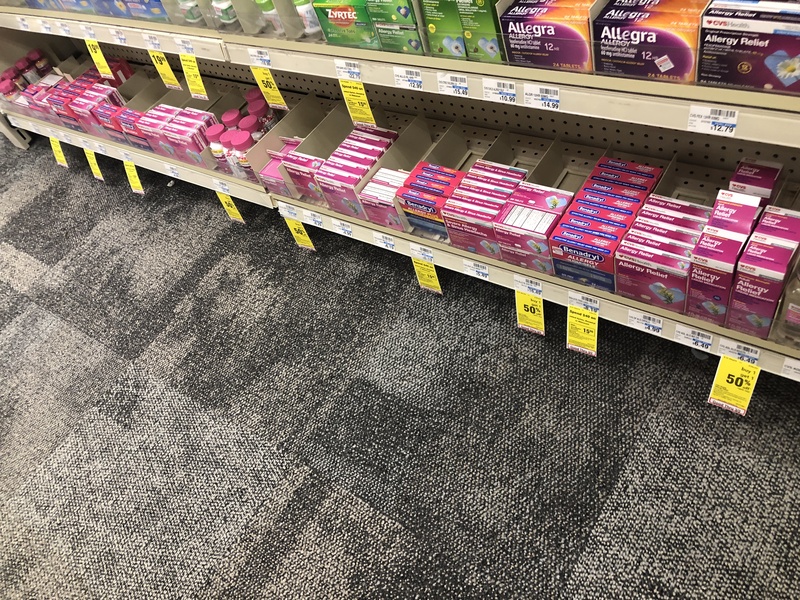 Benadryl products are usually packaged in a pink, hidden sad and lonely in the bottom row. Pink Benadryl makes people sleepy. There are better options. It’s better to use a more-modern, less-sedating antihistamine like Zyrtec (cetirizine), Claritin (loratidine), or Allergra (fexofenidine.) All of these are OTC and have cheap generics. They work taken as-needed, or can be taken every day. Antihistamines don’t relieve congested or stuffy noses—for those symptoms, a nasal steroid spray is far superior. Zyrtec and cetirizine come boxed in springtime green. If Claritin’s for you, it comes in friendly blue. Very few words rhyme with purple. This is Allegra. There are a just a few differences between the modern OTC antihistamines. All are FDA approved down to age 2, though we sometimes use them in younger children. They all come in syrups, pills, or melty-tabs. Zyrtec is the most sedating of the three (though far less than Benadryl). Zyrtec and Claritin are once a day, while Allegra, for children, has to be taken twice a day. A 2017 study showed that Zyrtec is marginally more effective than Claritin, so I’ve been recommending that one first. 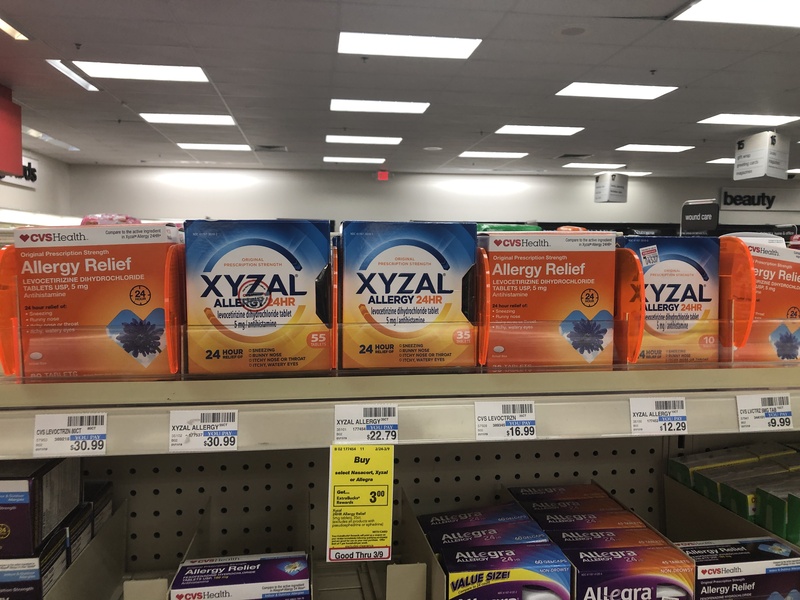 This year, there is one new player among the OTC antihistamines, called “Xyzal.” OK, I admit the name is cool — but it is therapuetically identical to Zyrtec. I don’t think it’s worth its typically-higher price. Decongestants work, too, but only for a few days—they will lose their punch quickly if taken regularly. Still, for use here and there on the worst days, they can help. 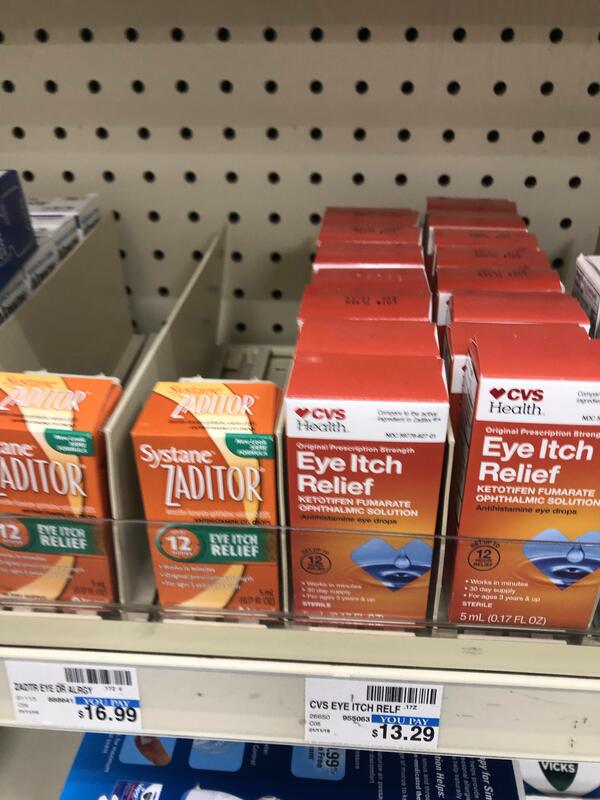 The best of the bunch is old-fashioned pseudoephedrine (often sold as generics or brand-name Sudafed), available OTC but hidden behind the counter. Don’t buy the OTC stuff on the shelf (phenylephrine), which isn’t absorbed well. Ask the pharmacist to give you the good stuff hidden in back. 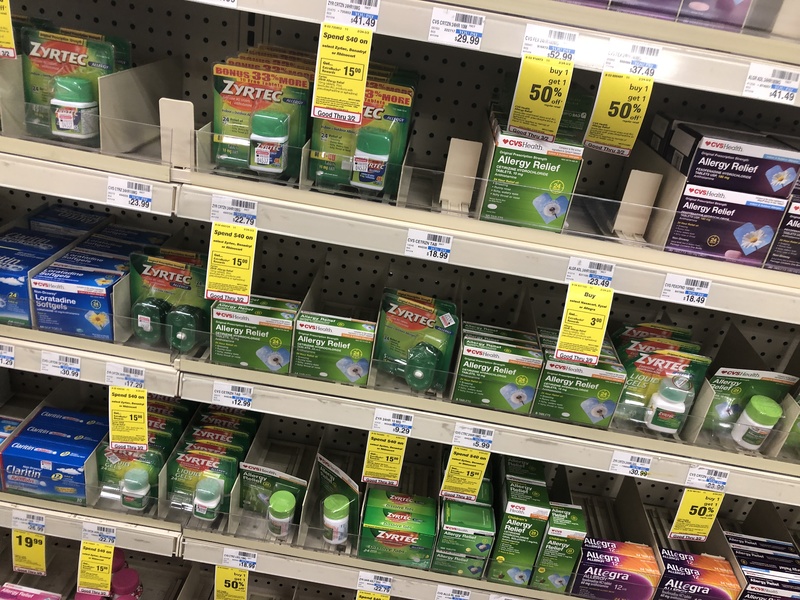 Nasal Steroid Sprays include many choices, all of which are essentially equivalent in effectiveness: OTC Nasacort, Flonase, Rhinocort, Sensimist, and many generics are available. All of these products are essentially the same. They all work really well, especially for congestion or stuffiness (which antihistamines do not treat.) They can be used as needed, but work even better if used regularly every single day for allergy season. Lots of steroid nasal sprays. They’re all essentially the same. Some minor distinctions: Nasacort is approved down to age 2, Flonase to 4, and Rhinocort to 6, though there’s no reason to think any are more or less safe for children. Flonase is scented (kind of an odd, flowery scent, which seems weird in an allergy medicine), and seems to be a little more burny to some people than the others. My personal favorite is Nasacort or its generic version. Here’s a quirk: Nasacort comes in 2 differently-packaged versions, for adults and for children. But the product itself is the same. The pediatric version sells for less, but it’s a smaller bottle. I guess because children are smaller. Weird. Children’s and regular Nasacort (and generic triamcinolone) are the same product in a different-sized bottle. Nasal oxymetazolone (brands like Afrin) are best avoided. Sure, they work, but after just a few days your nose will become addicted, and you’ll need more frequent squirts to get through the day. Just say no. Steroid nasal sprays are much safer than OTC Afrin. Eye allergy medications include the oral antihistamines, above; and the topical nasal spray steroids can help with eye symptoms, too. But if you really want to help allergic eyes, go with an eye drop. The best of the OTCs is Zaditor. There’s a generic version, though some people have told me the generic stings a bit. Zaditor? Who names these things? Bottom line: for mild eye or nose symptoms, a simple oral antihistamine is probably the best first line. For more severe symptoms OR symptoms dominated by clogging and stuffiness, use a steroid nasal spray. You can also use both, in combination, an antihistamine PLUS a steroid spray, for really problematic symptoms. Anything not improving on that combo needs to see a doctor. This is an updated version of previous posts. Ah, spring. The birds are tweeting, the flowers are blooming… and there’s a layer of yellow dust all over my car. And a whole lot of sneezing and stuffy noses! Fortunately, there are some great medicines out there to help reduce the symptoms of spring allergies, and most of them are inexpensive and over-the-counter. So many choices! Here’s an updated guide to help you pick the medicines that are best to relieve your family’s suffering. Antihistamines are still very effective for sneezing, drippy noses, and itchy noses and eyes. The old standard is Benadryl (diphenhydramine), which works well—but it’s sedating and only lasts six hours. It’s better to use a more-modern, less-sedating antihistamine like Zyrtec (cetirizine), Claritin (loratidine), or Allergra (fexofenidine.) All of these are OTC and have cheapo generics. They work taken as-needed, or can be taken every day. Antihistamines don’t relieve congested or stuffy noses—for those symptoms, a nasal steroid spray (see below) is far superior. There are a just a few differences between the modern, OTC antihistamines. All are FDA approved down to age 2, though we sometimes use them in younger children. They all come in syrups, pills, or melty-tabs. Zyrtec is the most sedating of the three (though far less than Benadryl). Zyrtec and Claritin are once a day, while Allegra, for children, has to be taken twice a day. 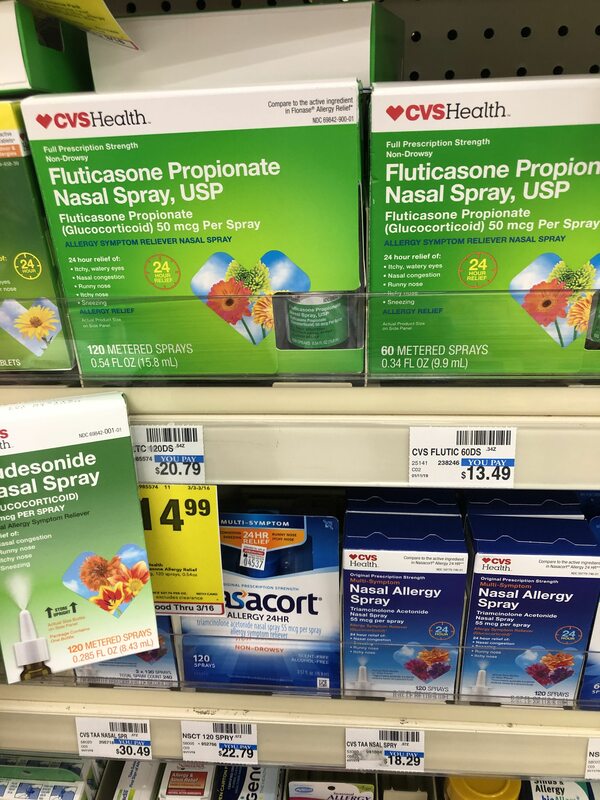 Nasal Steroid Sprays include OTCs Nasacort, Flonase, Rhinocort, and generic fluticasone (essentially identical to Flonase.) There are also many prescription versions of these, like Nasonex and Veramyst. All of these are essentially the same. They all work really well, especially for congestion or stuffiness (which antihistamines do not treat.) They can be used as needed, but work even better if used regularly every single day for allergy season. Some minor distinctions: Nasacort is approved down to age 2, Flonase to 4, and Rhinocort to 6, though there’s no reason to think any are more or less safe for children. Flonase is scented (kind of an odd, flowery scent, which seems weird in an allergy medicine), and seems to be a little more burny to some people than the others. Nasal oxymetazolone (brands like Afrin) are best avoided. Sure, they work—they actually work great—but after just a few days your nose will become addicted, and you’ll need more frequent squirts to get through the day. Just say no. 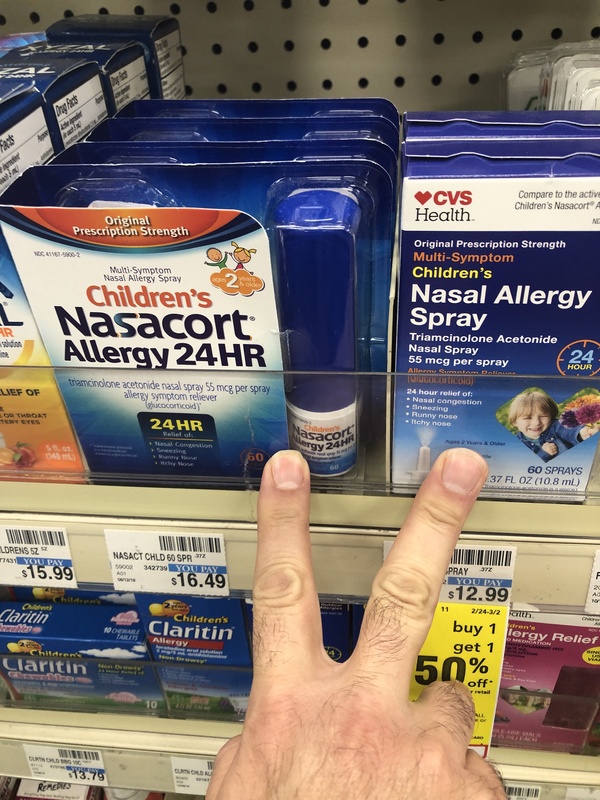 Steroid nasal sprays, ironically, are much safer than OTC Afrin. Eye allergy medications include the oral antihistamines, above; and the topical steroids can help with eye symptoms, too. But if you really want to help allergic eyes, go with an eye drop. The best of the OTCs is Zaditor. 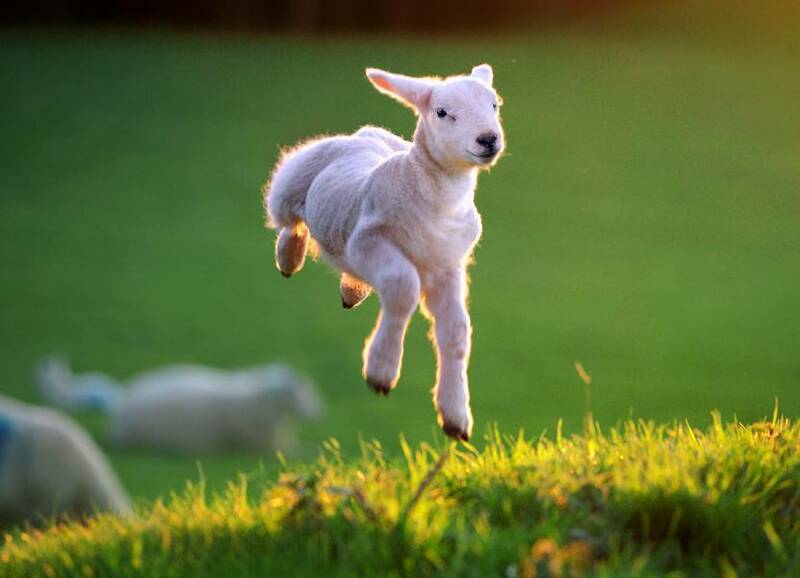 Ah, spring is here. Time to plant my little seedings. Time to wash the yellow pollen off my car. And time to sniffle, sneeze, and snork. Confused by all of the choices of allergy meds? Look no further than this short, no-nonsense Pediatric Insider guide to allergy medications. Antihistamines are very effective for sneezing, drippy noses, and itchy noses and eyes. The old standard is Benadryl (diphenhydramine), which still works well—but it’s sedating and only lasts six hours. Most people use a more-modern, less-sedating antihistamine like Zyrtec (cetirizine), Claritin (loratidine), or Allergra (fexofenidine.) All of these are OTC and have cheapo generics. They work taken as-needed or daily. 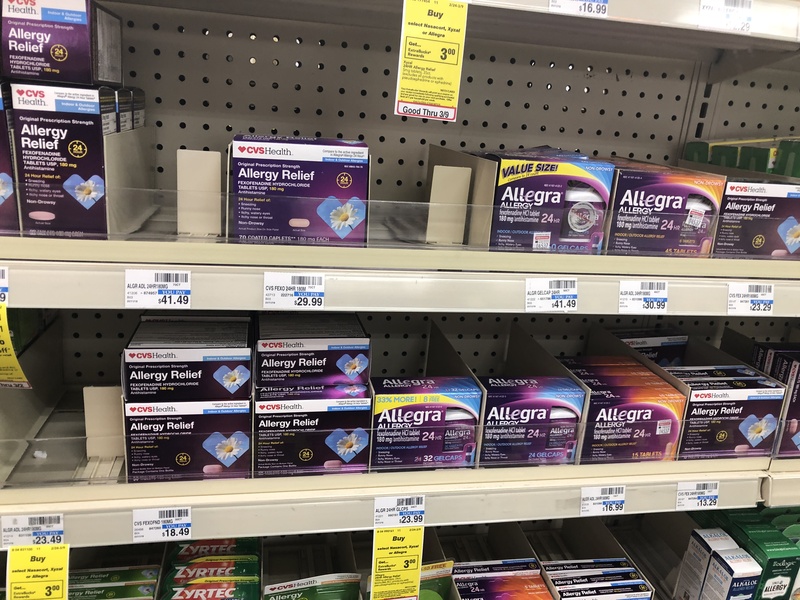 There are a few prescription antihistamines, but they have no advantage over these OTC products. Decongestants work, too, but only for a few days—they will lose their punch quickly if taken regularly. Still, for use here and there on the worst days, they can help. 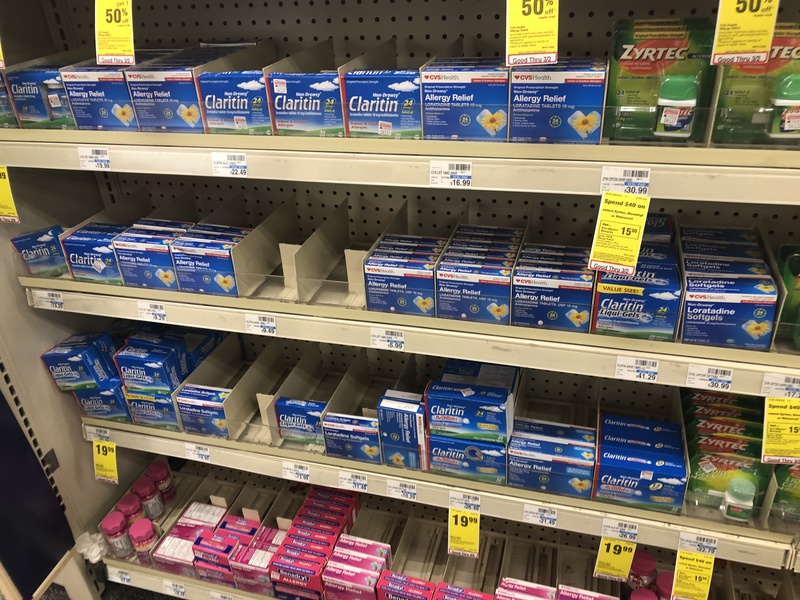 The best of the bunch is old-fashioned pseudoephedrine (often sold as genertics or brand-name Sudafed), available OTC but hidden behind the counter. Don’t buy the OTC stuff on the shelf (phenylephrine), which isn’t absorbed well. Ask the pharmacist to give you the good stuff he’s got in back. Nasal cromolyn sodium (OTC Nasalcrom) works some, though not as strongly as rx nasal sprays. Still, it’s safe and worth a try if you’d rather avoid a prescription. Nasal oxymetazolone (brands like Afrin) are best avoided. Sure, they work—they actually work great—but after just a few days your nose will become addicted, and you’ll need more frequent squirts to get through the day. Just say no. The prescription nasal sprays, ironically, are much safer than OTC Afrin. Nasal Steroid Sprays include OTC Nasacort, and Rx Flonase (or generic fluticasone), Rhinocort, Nasonex, Nasarel, Veramyst, and others. All of these are essentially the same (though some are scented, some are not; some use larger volumes of spray.) All of them work really well, especially for congestion or stuffiness (which antihistamines do not treat.) They can be used as needed, but work even better if used regularly every single day for allergy season. Antihistamine nose sprays are topical versions of long-acting antihisamines, best for sniffling and sneezing and itching. They’re all prescription-only (though they’re super-safe). They’re marketed as either the Astelin/Astepro twins (Astepro came out later, when Astelin became available as a generic; it lasts longer) or Patanase. Bonus! Eye allergy medications include the oral antihistamines, above; and the topical steroids can help with eye symptoms, too. But if you really want to help allergic eyes, go with an eye drop. The best of the OTCs is Zaditor, which works about as well as rx Patanol, which they’re trying to replace with rx Pataday. No one can be allergy tested for “everything.” With skin testing, there’s only so much skin to use to test; and for blood testing, well, even a vampire can only get so much blood out of a child. Allergy testing uses a panel of common allergens for the area, but can’t possibly cover all possibilities. It may be that she really is allergic to something, but she wasn’t tested for it. It’s also possible that the test itself didn’t give an accurate answer. Allergy testing isn’t close to 100% correct, and both false positives (the test is positive, but the child really isn’t allergic) and false negatives (the test is negative in a truly allergic child) do occur. Even though she’s been extensively tested, it could also be that the test is wrong, and she is allergic to something that she tested negative. There are other things that might be going on, besides allergies. Cold viruses can trigger an itchy or runny nose, so if she’s been getting one cold virus after another it can seem like one long illness. There’s also a non-allergic condition called “vasomotor rhinitis” which causes nasal congestion and sneezing, especially in bright sunlight. Noses can also be bothered by cigarette smoke or other irritants, triggering allergic-like symptoms, without actually causing true allergy. Rarely, an anatomic obstruction like a nasal polyp may cause symptoms similar to chronic allergies. It can sometimes be tough to tease these situations out. Often, a best next step is to try regular use of an effective allergy medication, even though she tested negative. 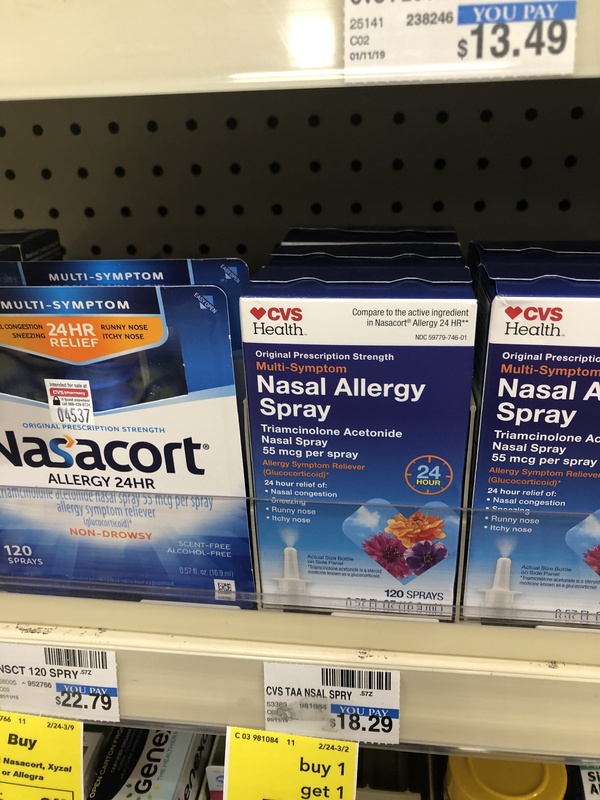 The most effective allergy medicines are topical prescription nose sprays (do NOT regularly use an over-the-counter medicated nose spray—they’re addictive.) If allergy medications work, at least she’ll get some relief. You can also try to rinse her nose out with gentle saline solution, which may relieve symptoms caused by irritation (warning: some kids do not like to have their noses rinsed out. Imagine that.) Further discussions and evaluation by an allergist, pediatrician, or ENT (ear-nose-throat) specialist may also be helpful if her symptoms continue to bother her.